She's a loving, free spirited brown and cream lycan. The daughter of the chief of her tribe. She shows many leadership qualities along with an incredible need for adventure. She's very kind and free spirited. She genuinely cares for others and can sometimes have a bit of a temper when it comes to people telling her what to do. She has the tendency to sometimes jump into things that sometimes can get her in trouble. Occasionally she can be quite shy and hesitant though she does her best to be brave. She also can sometimes have a very flirty streak in her. V1:Mara was born into a tribe of lycans shortly after her fraternal twin brother Mako. The chief's daughter she had quite a few expectations held for her. Though she did her best to take it in strive, wanting to contribute any way she can even if it's considered improper. When she and Mako were still toddlers their home was stormed by outsiders. Her mother was killed in the attack and from there on out her father(s) grew more protective of his children. Though Mara's defiant spirit didn't stop her from doing what she wanted. She had even turned her brother purple for a while when he wouldn't let her play with him and his friends. As she grew closer to adult hood though her life grew more and more complex as her duties to the tribe became more present. 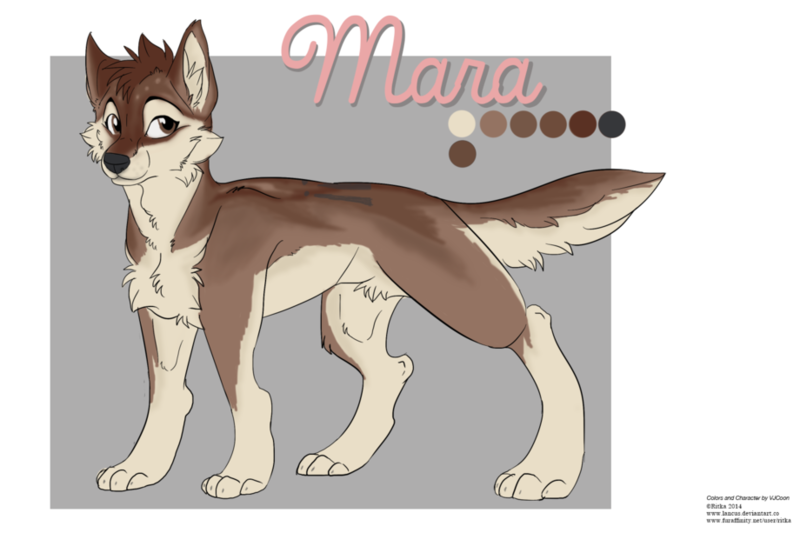 V2:Mara was born and raised in Miami along side her fraternal twin brother. While her brother was more of a artist she loved surfing and just being active. When Mako's father died she felt a deep loss as well. As a result she went and lived with her father for a time wanting to get to know him better. Her brother visited her often though it was far more difficult for them to be apart than she could of imagined. V3:Mara was born into a rich family. Her father having had taken her from her real mother and fraternal twin when she was a infant. As she grew she had a happy life with her parents that grew increasingly toxic over the years as she and her parents had their disagreements along with Mara discovering her father was having a affair with his secretary. Along with her just acting out for a number of other reasons. She lives in a pre-industrial revolution earth. Living out in the woods with her tribe. Her people being very commonly wanted for slaves. Her family doesn't trust outsiders with good reason though at the same time they don't like to turn there backs on someone in need. She's around 5'6" with a toned, curvy body and decent sized breasts. (Sometimes multiple) Along with kind, sensitive brown eyes. She has pointed husky like ears and a medium length fluffy tail. She has cream fur on her chest, snout, hands,feet and underside of her tail. Varying shades of brown's start on the bridge of her muzzle, under her eyes and go back covering her ears, forehead, back, hair fluff, things and part of her arms. On her forehead she has 6 cream spots that shrink as they move back on her head almost looking like a sort of crown. On her back is the Celtic symbol of arwen. Sometimes she's digitigrade, sometimes plantigrade and sometimes feral. Or even other species though what remains true is her body type and fur colors. She often wears something like a simple dress with a big slit down the side so she can run and jump and move with ease. Though she also wears a leather top and loin cloth or something along similar lines. Modern day she tends to dress in snug fitting t-shirts and tops, with shorts, jeans or capris. Sometimes she wears dresses though she enjoys pants. As a rule she likes to wear things she can move in. Around her neck she often wears a necklace with a blue pendant. She also sometimes carries a small bag or even a drawstring backpack with a movie character on it. This is a sort of feral ref I did of her markings on a ritka(FA) base. Rather than making my own base I looked up a base and just focused on her markings. Hopefully soon I'll have a actual ref for her done. Though this and that pinup type pic I posted of her earlier should serve my purpose for a while. Keep an eye out I plan to update this submission with pics of her future refs that include her anther and possibly even alternative species refs.